Western Digital subsidiary SanDisk has announced the world's highest-capacity micro-SDXC card which stores a whopping 400GB, just two years after launching a 200GB version. Back in March 2015, SanDisk boasted of a micro-SDXC capacity high with a 200GB model priced at a US recommended retail price of $399.99 (around £311 excluding taxes). 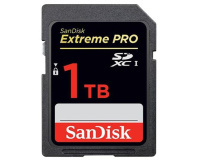 Now, two years later, the march of technology has not only resulted in double the capacity but a lower price: SanDisk's latest offers 400GB of storage at a US recommended retail price of $249.99 (around £194 excluding taxes). Sadly, and in keeping with its 200GB micro-SDXC launch two years ago, Rathjen and SanDisk have both been somewhat coy about exactly how the doubling in capacity has come about. According to Western Digital, it's simply a case of the company 'leveraging its proprietary memory technology and design and production processes that allow for more bits per die,' a non-statement which exactly mirrors that for the 200GB launch two years ago and the 128GB launch a year before that. Whether the 'proprietary memory technology' to which the company refers is the three-dimensional BiCS technology developed in partnership with Toshiba is not known. SanDisk has claimed transfer speeds of up to 100MB/s in compatible devices, with the card meeting the SD Assocation's A1 App Performance Class specification which requires 1,500 random read input-output operations per second (IOPS) and 500 random write IOPS along with a minimum sustained sequential write of 10MB/s. It falls short, however, of the more demanding A2 App Performance Class which would require 4,000 random read and 2,000 random write IOPS - suggesting SanDisk has traded performance for capacity in its design. SanDisk has set a $249.99 recommended retail price in the US, which has translated to a pre-order price of £224.99 at UK retailers. The company's two-year-old 200GB design, meanwhile, has dropped in price since launch to just £65.99, with its 256GB successor priced at £124.99.